The first design I tried on was this one, called "A Little Cheetah". 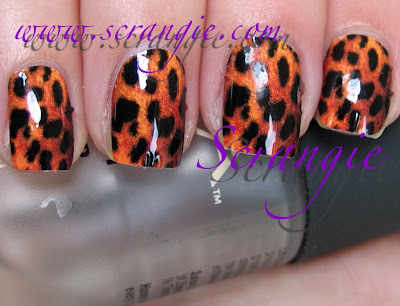 I wore these the night I went to go see Rammstein- I had to have a special mani for that and these were just the thing! I used the custom sized ones that were fitted to my nails. I removed all my polish, diligently cleaned each nail with soap and water, then alcohol and let them dry fully. I peeled each applique off the paper backing, lined them up onto the correct nails and then applied heat from my hairdryer while smoothing them down until they shrank a bit. Such an amazing design, isn't it? 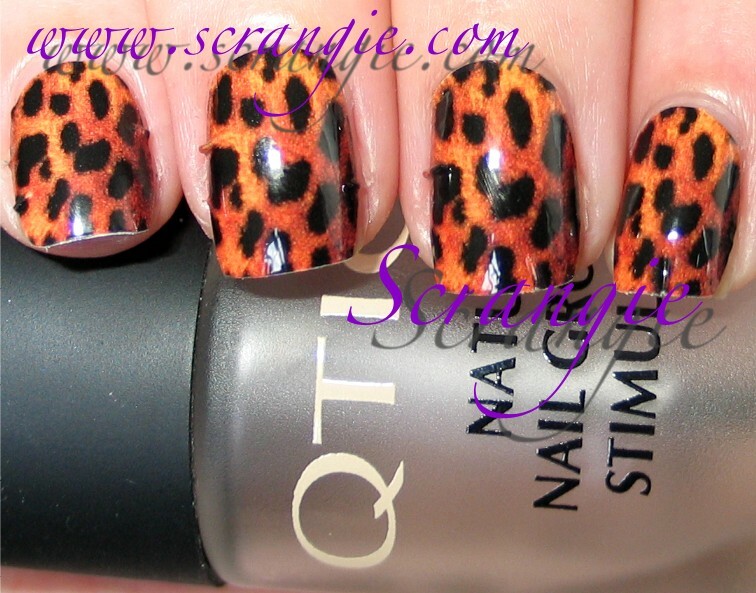 A photo-realistic, bright/colorful textured cheetah fur pattern. They looked incredible at arm's length- such a detailed pattern that I don't think I could ever duplicate on my own. Seriously cool. See how they're all peeled up at the tips? They're sticky underneath so they attract lint and stuff which makes them even harder to stick down again. To remove them, I just warmed them under hot water and peeled them off. This left my nails a little rough, so I think I might have not heated them enough. Could this be happening because I filed off the excess after I had applied heat and allowed them to cool? What am I doing wrong? I had really hoped to be able to wear these for a week or more, like I can with other appliques. So.... did this happen to anyone else? I know that lots of people have tried these but I can't remember if anyone said they peeled or not. Any ideas? Did I do something wrong? I really, really want to love these because the designs are incredible. I don't think I can deal with this much peeling, though! 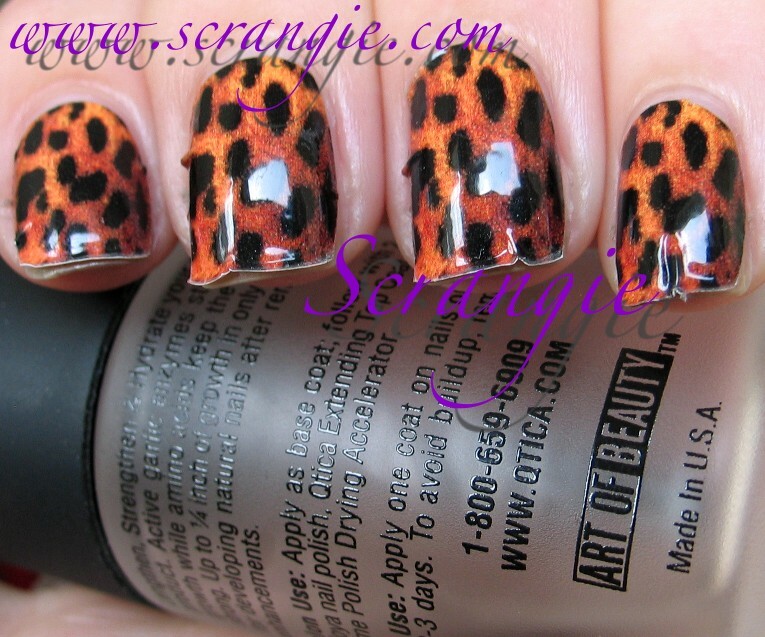 EDIT: I forgot to mention, unlike the Sally Hansen or Incoco strips/appliques which are made of polish, these Inque appliques are printed vinyl stickers. I haven't tried Inque, but I've used Sephora by OPI and I had the same problem...they all lifted at the edge within a day. I thought maybe I need to apply more heat the next time, but truly I have no idea. I think maybe they're just designed this way. Weird. I love that design! I've only tried the SH salon effects and I have issues applying those...I just cant seem to get the hang of it! Wow that is a shame, they looked wonderful on the first day! Adorei isso, que lindo !!! Traduzo seu site pelo Google Chrome para o português e leio tudo muito bem! Um espetáculo! Agree! An amazing design on these. Interesting that these are vinyl and not polish like the others out there. I would think vinyl might present more problems with application due to it's not able to be made as sheer as polish strips are. But then also, I would expect wear time from vinyl to be longer than polish strips. Thanks for the review and photos. I am major lemming this and I am not one to like a lot of the nail art things. I so love my professional looking manins/pedis. That really is fantastic! Too bad they don't wear better. What a shame that they didn't last longer! That really is a beautiful and vibrant effect. These do look amazing! I would have been annoyed if I paid for these and they peeled so fast.